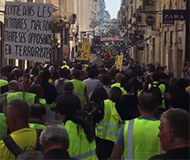 Smaller Yellow Vest protests took place across France over the weekend. The reinvigorated police presence and the deployment of military troops discouraged participation in demonstrations against the administration of President Emmanuel Macron. After last week's trouble at the Champs-Elysees, large public gatherings were banned in the western part of Paris and the downtown areas of major cities. Participation dropped 42 percent from last week, according to the Interior Ministry's count. The crackdown on speech, however, did not save the automated ticketing machines. On Friday, the speed camera on the RD438 in Plasnes was destroyed by fire. On Thursday, the speed camera in Brest near the Iroise Bridge was set ablaze. On March 18, the speed camera in Les Rousses was blinded with a coat of green spraypaint. A speed camera is still missing on Ring Road in Regina, Canada. According to CJME Radio, the device was involved in a collision earlier this year that took out the photo radar box and supporting equipment. In Goole, England, a vigilante used his blue VW Transporter van to block the speed camera from issuing tickets on Airmyn Road on Thursday, the Hull Daily Mail reported. In Carnate, Italy, on Friday, vigilantes smashed open one of the speed cameras on the Via Fornace while the other was knocked over and tossed into a nearby field, Giornale di Monza reported. In Caldogno, vigilantes uprooted the orange "Velo OK" brand speed camera from its position on the Via Pagello, according to Il Giornale di Vicenza. They then moved the device and set it up on a remote dirt road, unable to issue tickets.